The KAU Under 12 Little League team celebrates its District 7 championship and will advance to the state tournament this weekend. 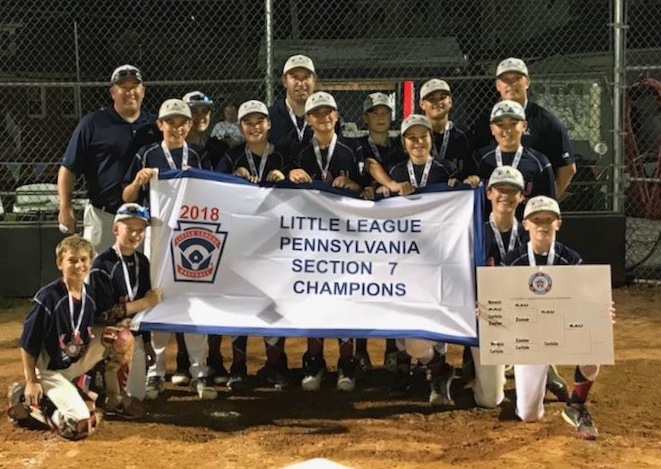 The Kennett Square 12 U Little League captured the Section 7 championship Tuesday night, defeating Carlisle 7-0. Levi Brawley got the win on the mound for KAU. A home run by David Lillis and multiple hits by Tague Davis and Trevor Dunne contributed to KAU’s strong offense. Defensively, Drew Zieg, Jack Bowdoin and Daniel Donnelly all had tremendous plays. The next step on the road to Williamsport for KAU will be the Pennsylvania State Tournament in Berwick. Their first game will be this Sunday. So far in tournament play, KAU is undefeated through both the district and sectional playoffs. They have outscored their opponents 50-5 in the districts and 32-0 in the sectionals. KAU is coached by Jim Larkin, Brian Lillis and Sean Burns.